A SWORD & PLANET SPOOF! Bernie Smith had no idea what to expect when he found himself zapped out of Huey Fleener’s cornfield in Tasselville, Iowa and deposited on the distant and deadly planet of Persus. Join him on his weird and wild adventures: he is fattened up to serve as an offering to the monster-gods of Kotaxx; he squares off against the hairy, horrible Dhufoids; he battles the Godawful Thing in the Labyrinth. 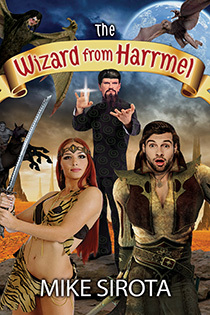 And ultimately, in order to save Thanna Dora, the most incredible woman on two worlds, Bernie must summon enough courage to face Heevit Upp, nastiest of the nasty—THE WIZARD FROM HARRMEL.